Dallas Clark in seven NFL seasons has been one of the Indianapolis Colts' top offensive players, and a huge reason for their success. What he never has been is a Pro Bowl player. Colts President Bill Polian said that needs to change. Clark, who has caught 38 passes for 485 yards and three touchdowns this season, had a 27-yard touchdown reception in the Colts' 42-6 victory over the St. Louis Rams. It was the sort of play Polian said Clark has made almost routine during his NFL career, and on his weekly radio show Monday, Polian said Clark should make the first Pro Bowl appearance of his seven-year career. “If he doesn't go to the Pro Bowl, we'll have to have an investigation,” Polian said with a laugh on his radio show on 97.1 Hank FM in Indianapolis. “We'll have to get the Supreme Court involved like Bush v. Gore or something. The bottom line is the balloting I'm told began Monday on NFL.com, so vote early and often for No. 44, Dallas Clark. When Colin Cole met his wife, Kaye, her knowledge of football was an instant attraction. Now she will put it to good use in Saturday’s “Football 101” workshop. When Colin and Kaye Cole first started dating, there was an immediate attraction. “When I met her, she knew a lot about football,” said Colin Cole , the Seahawks’ nose tackle. “And that’s one of the main reasons that she and I clicked so well, because I don’t have to worry about having to go another room to watch football. Kaye Cole grew up in what she calls “a football family.” Her father was a Dallas Cowboys fan. She was a San Francisco 49ers fan. Her brother played the sport. “Kaye is a big fan, and she just loves it,” Colin said. Kaye is putting that football background to good use Saturday, when the Seahawks Women’s Association is holding a “Football 101” workshop at Virginia Mason Athletic Center. There are still a few spots open for the workshop, which begins at noon and runs until 5 p.m. Registrations are being taken at Seahawks.com. The event will be broken into four quarters and feature presentations by three former players – Dave Wyman, Ray Roberts and Eddie McMillen. Paul Johns, who also played for the Seahawks and is now the team’s assistant director of community outreach, will serve as the MC. There also will be autograph and “postgame” sessions, the later to include a raffle. “What we’re trying to impart to everyone is that you can have no football knowledge or you can have a little bit of football knowledge, and you can come to the ‘Football 101’ workshop and get the technical side of what’s going on,” said Kaye, who is a co-chair of the event with Linda Ruskell and Kathy DeHaven – wives of the team’s president and special teams coach. The proceeds from the event will benefit the Puget Sound affiliate of the Susan G. Komen Breast Cancer Foundation and the Breast Cancer Sisterhood. Cole has her PhD in counselor education and supervision. She taught an online course in sports psychology for Capella University before moving to the Seattle area this spring after Colin signed with the Seahawks in free agency. It was Kaye’s football background that also led to her meeting Colin. It was at the University of Iowa, when Kaye’s brother made a recruiting trip. Kaye accompanied her brother because their mother couldn’t make it. Colin jokingly likes to tell everyone that Kaye “stalked” him. But Kaye tells a different story. Kaye laughed, before telling her side. “Colin sat across the table from me during my brother’s recruiting trip to Iowa,” she said. “We were all talking back and forth about which state produced the best athletes. Of course Colin said Florida, because he’s from Florida. Someone else said Texas. After Kaye enrolled at Iowa their paths crossed again, this time because Kaye had three tickets to a lecture series featuring Bill Clinton. One guess who that was. Regardless of who instigated the beginning of this match made in football heaven, those attending Saturday’s workshop will benefit from their love-of-football relationship. 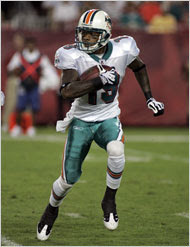 From Omar Kelly's "Ted Ginn Jr. produces big play for Dolphins"
Ginn shot off the line of scrimmage in the fourth quarter, using his long speed to put at least 3-yards between him and Jets Pro Bowl cornerback Derrelle Revis. He caught Chad Henne's rocket of a pass in stride, producing the big strike the offense has long sought. .I [had] to get it. It was a dead point on [the ball], but I knew if I stayed on my course I was going to make the catch." Camarillo said as soon as the coaches called the play he had a feeling something special was going to happen. The play, which is designed for Ginn to go over the top of a bunch formation, had worked well in practice, and all the team need was the offensive line to provide Henne time, which they did. Henne wasn't sacked once by the Jets aggressive blitzing defense, which was consistently brining pressure. Henne, who making his second start, finished with a 130.4 quarterback rating. "Offensive line gave us time, Teddy ran a great route," said quarterback Chad Henne, who completed 20-of-26 passes for 241 yards and two touchdowns. "[It] boosted his confidence that we can get the ball down the field. Big play there." Even Ginn admitted that type of catch, which was a regular for him in college, is a morale booster, something Ginn hopes he and Henne can build on, and make a regular occurrence. "It's not about how many catches you have," Ginn said. "It's about the big ones you bring down when you do have [opportunity]." The Browns don’t have the best team in the NFL. After all, have you looked at their record? But they do have the best special teams. In fact, they’re so much better than the rest of the clubs that it isn’t even close. They are as far ahead of the rest of the NFL when it comes to special teams, as they are behind the rest of the league when it comes to overall play. That was evident – again – last Sunday at Ralph Wilson Stadium. They did a lot of things wrong, most of which were on offense, in struggling past a bad Buffalo Bills team 6-3. But as been the case for several years now, their special teams carried them. On most Sundays, even the special teams can’t do quite enough to secure a win. There is still too much wrong with the rest of the club to be able to overcome all those mistakes. But on some days, such as last Sunday, their special teams are so overwhelming that even one of the worst passing performances in team history can’t get in the way. You start with Joshua Cribbs. He is the one player on the entire team who scares the daylights out of opposing coaches because he is truly a threat to score every time he touches the ball, no matter where he’s at or who he’s playing against. When he settles under a punt or kickoff, you can feel the electricity in the crowd as everyone holds their breath in anticipation of something really spectacular happening. Those fans have not often been disappointed. On a team that has had a slew of great returners with the likes of Bobby Mitchell, Greg Pruitt, Eric Metcalf, littler Dino Hall and even Dennis Northcutt, Cribbs may be the best the Browns have ever had. How in the world can a slash-type quarterback in college transition into being such a great returner? Who knows? But he just may be the best rookie free agent the Browns have ever signed. Then there’s Ryan Pontbriand, who is the best long snapper the club has ever had. After all, he’s been to the Pro Bowl the last two years. 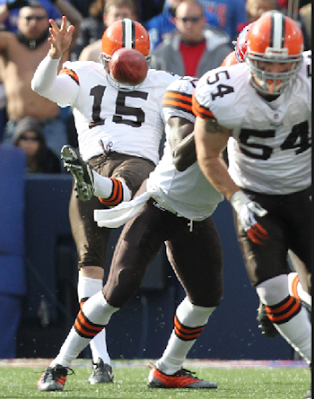 No Browns long snapper has ever been to the game. How important is a long snapper? The Cincinnati Bengals blamed their long snapper for the great Shayne Graham having an extra point and field goal blocked against the Browns. The reason? The snaps were too high, throwing Graham off his stride. Everybody knows how good Phil Dawson is, and has been. 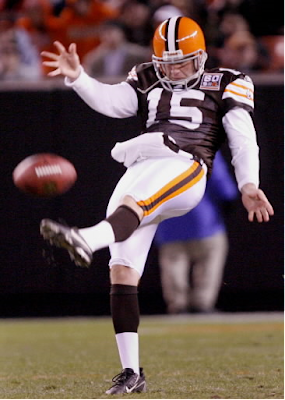 He is arguably the best kicker the Browns have ever had. Again, that’s saying a lot since Lou Groza, Don Cockroft, Matt Bahr and Matt Stover kicked for this team. Dave Zastudil doesn’t get the credit he deserves. He’s the team’s career leader in punting average, ahead of the great Horace Gillom, Chris Gardocki and Gary Collins. He never ceases to amaze in terms of kicking them not only very high and long, but also very accurately. Time and time again, he places balls near the goal line – sometimes just inches away – to help the Browns almost always win the battle of field position. He was at his best last Sunday. It may have been his best game ever – and he’s had some great ones. But there are other special teamers who also deserve recognition. Mike Adams takes a back seat to no one when it comes to covering kicks. Ditto for a newcomer this year, Blake Costanzo, who recovered the fumbled punt to set up the game-winning field goal against the Bills. And have you heard about the nose tackle named Shaun Rogers? Just as he pushes the pile backward on defense, so, too, does he do it on special teams, making a blocked kick a real possibility every time he’s on the field. Brad Seely is doing a great job coaching the special teams. But so did Ted Daisher before him. And Jerry Rosburg before him. There is some real tradition here. People want to point to all the things the expansion era Browns have done wrong since taking the field again in 1999. And that list is long. We don’t need to belabor it here again. Everybody knows what those things are. But what the Browns have done right – right from the get-go in 1999 – is the way they’ve played special teams, all aspects of special teams. If only the offense and defense had been up to par with the special teams all these years, then the Browns wouldn’t have had all those disappointing won-loss records, with just two winning seasons and one playoff appearance, with no victories. It’s a place to start, and as we watch head coach Eric Mangini try to build a winning club overall, it’s a place to watch every Sunday. Groza and Gillom were far ahead of the competition when the original Browns started in the All-America Football Conference over 60 years ago. A lot of things have changed since then, but that hasn’t. Browns fans, for the way they have supported this team over the years, and for the way they fought to get the club back, deserve to watch the very best on Sundays. And they get that chance. Now the Browns coaches and personnel people need to make the rest of the club special year after year as well. My first instinct --and second and third -- was not to review the CBS Sports game tape from the Browns' 6-3 victory over the Bills last Sunday in Orchard Park, N.Y. My instincts were to burn it. I was there. I didn't need to see the monstrosity again. But I went against my better judgment and took another look, primarily because I wanted to see if Browns punter Dave Zastudil had as good of a game as it appeared. Zastudil and teammates Mike Adams, Shaun Rogers, Kamerion Wimbley, Robaire Smith and Jamal Lewis performed superbly. Those who know me know I have a bias in favor of Z-Man. We are both products of Bay High School and I've known his family since he was in middle school. Even if I were totally objective, though, I would have concluded that he was the player of the game. Dealing with nasty winds, Z-Man placed six of his nine punts inside the 20-yard line and one on the 20. He pinned the Bills at the 1 (generous spot put ball closer to yard line than goal line) and the 4 in the fourth quarter. He also stopped one at the 1 in the second quarter. He had zero touchbacks and Roscoe Parrish mishandled his last punt, leading to the game-winning field goal. Bottom line: the Browns probably would not have won if Z-Man simply had a good day. Zastudil, when factoring in weather conditions and what his team has asked him to do with his punts, is one of the game's best since the beginning of 2008. The Browns not only pulled off a win this past Sunday, but punter Dave Zastudil did such a great job that he's been named the AFC Special Teams Player of the Week for games played on October 11 and 12. The league announced the award on Wednesday. 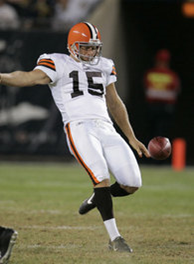 During the Browns 6-3 win over the Buffalo Bills on Sunday, Zastudil recorded nine punts for 386 yards. Seven of the nine punts were downed inside the 20, and three of those were placed inside the five yard line. His last punt of the game was fumbled on the Bill's 16-yard line and was recovered by Cleveland, which led to a game-winning field goal seven plays later with just 26 seconds left int he game. With seven punts inside the 20, Zastudil is now tied with Josh Miller for the third-most in a single game since the statistic began being recorded in 1976. The last time such a feat was accomplished was in 199, when Bryan Barker of the Jacksonville Jaguars recorded eight punts inside the 20. 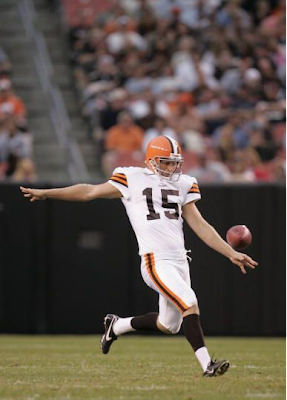 Zastudil is the first Browns punter to win the AFC Special Teams Player of the Week since Kyle Richardson earned it during week 9 of the 2005 season. It is also his first time winning the award. Special teamer of the week: Dave Zastudil. With swirling winds producing gusts of 34 miles per hour at Buffalo, the Browns punter averaged 42.9 yards with a 42.1-yard net and had seven of his nine punts downed inside the 20 — and three inside the 5. His final punt, with three minutes remaining, had enough bounce and spin that Roscoe Parrish muffed it, allowing for the Blake Constanzo recovery at the Bills 16 that set up Billy Cundiff's game-winning field goal. DAVIE - According to Dolphins coach Tony Sparano, there's a simple explanation why rookie receiver Brian Hartline has quickly worked his way up the Dolphins' depth chart. Hartline, who scored his first touchdown last Sunday against the Bills, has already learned all three of the team's receiver spots, and can play them all effectively according to Sparano. Despite Hartline's limited NFL experience, Sparano labeled the Ohio State product the smartest receiver amongst the units, and said he's even begun to take charge in their meeting room. But that aspect of Hartline's makeup really isn't too surprising to Sparano considering he and General Manager Jeff Ireland first noticed it during the draft process when they conducted a film study with Hartline. Ireland said it was that intimate session that made Hartline, who caught 90 passes for 1,429 yards and 12 touchdowns in his three seasons for the Buckeyes, a draft target. "Smart player, really smart player," Sparano said of Hartline, who was selected in the fourth-round with the draft's 106th pick. "[He] can go into the game at any one of [the receiver spots] at any course of the game and handle that workload. I think he has really come along very, very well. He is exactly what we thought he would be." So far, Hartline has caught six passes for 53 yards while fellow rookie, Patrick Turner, a USC standout the Dolphins selected in the third-round, hasn't dressed for a single game. Sparano points out that Turner, who excelled during OTA sessions and training camp, had his best week of practice this week, but said it's a "numbers game" regarding his playing status. While Hartline can contribute on four special teams phases Turner can only do two, and the Dolphins typically only carry four receivers on the game day roster. "He's been getting better and better at practice and at some point [will] get an opportunity," Sparano said. a. Weirdest sight of the opening United Football League weekend: Officials in blood-red shirts and black pants. b. Second-weirdest sight: Simeon Rice sacking the quarterback. He's 33, and playing for the New York Sentinels. With team training headquarters in Florida, by the way. San Francisco and Las Vegas are headquartered in Casa Grande, a southern Arizona city about 20 miles north of Jackrabbit. I kid you not. c.JaMarcus Russell has such terrible pocket awareness. It's like he's playing quarterback for the first time. He is so unaware of rushers around him -- like he has no peripheral vision. And quarterbacks are supposed to have clocks in their heads, telling them how long they can hold onto the ball. Russell's clock needs batteries. He is powerfully ill-equipped to be a starting NFL quarterback. 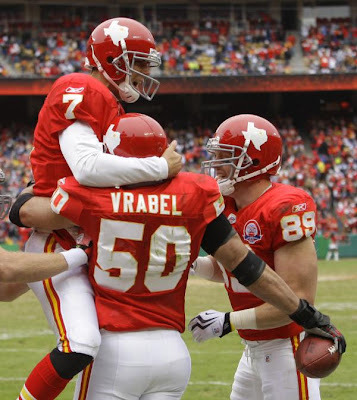 d.Mike Vrabel: 11 career catches, 11 touchdowns. 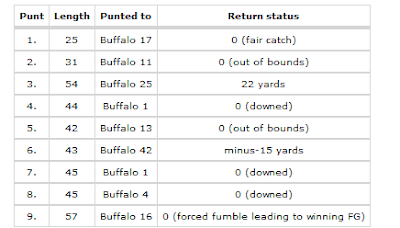 Average drive start for nine Buffalo drives on Zastudil's punts: Buffalo's 15-yard line. Ted Ginn was a coach and full-time high school security guard in 2006 when he proposed to the Cleveland Metropolitan School District an academy based on his brand of mentoring. CLEVELAND — A 16-year-old former gang member with a faux hawk waited at a recent high school football practice to approach Coach Ted Ginn, who is known for producing elite college and professional players. He did not want to join the team. The teenager wanted to enroll at the public school Ginn founded to give at-risk boys enough care, structure and education to succeed. Ginn suggested that the aspiring freshman, Joseph Williams, get a haircut and meet him in his office the next morning. Williams shaved his head and rode his bike four miles to the school. The school, Ginn Academy, had a spot for him, and Williams teared up. “I feel blessed,” he said. Ginn, who has never taken a college class, was a coach and full-time high school security guard in 2006 when he proposed to the Cleveland Metropolitan School District an academy based on his brand of mentoring. Even as the city’s graduation rate has fallen to 54 percent, Ginn Academy, now in its third year, has grown to 300 students, and no one has dropped out. Of the 37 students in its first senior class, 32 have already passed Ohio’s mandatory graduation exam. Ginn at a morning assembly. Ginn Academy classes are smaller than the city’s average, and teachers are asked to be more involved. Although Ginn used his prominence as a football coach at Glenville High School to start his academy, it is not to be confused with diploma mills where football and basketball players go to burnish their academic credentials to qualify for college. Ginn Academy has no varsity sports teams; students who are athletes can play for neighborhood high schools like Glenville, where Ginn was a security guard. Eighty-nine students at Ginn Academy are among the 107 varsity and junior varsity football players at Glenville. The academy follows two basic philosophies that have worked elsewhere: hiring the best teachers based on a rigorous interview process, not the ones with the most seniority; and full immersion with additional staffers who are always on call. “Those two areas of focus are what we see in some of the highest-performing low-income charter schools,” said Jon Schnur, the chief executive and a co-founder of New Leaders for New Schools, a group that trains principals nationwide to improve school performance. As the executive director of the academy, Ginn, 53, provides motivation and inspiration. He often speaks at the daily morning session. A fixture in the hallways, Ginn dispenses hugs, one-on-one pep talks and reminders to the boys to tuck in their shirts. All students at Ginn Academy must turn right when leaving class, even if they would reach their destination more easily by turning left. Over the years, he said, too many students have gone the wrong way in life, like one Glenville quarterback from the 1980s who failed to qualify for a college scholarship. Ginn said there were no academic alternatives to help, and the quarterback ended up on the streets and addicted to crack cocaine. That kind of lost potential haunts and motivates Ginn. At the academy, students know someone is always looking out for them. In addition to 23 teachers, seven youth support staff members serve essentially as life coaches, each in charge of 30 to 50 students. The seven, who receive district-issued cellphones, are on call 24 hours a day, even during the summer, to help students in emergencies or even to arrange rides to school. Ginn Academy classes are smaller than the city’s average, and teachers are asked to be more involved. The Cleveland Teachers Union endorses Ginn’s efforts, said its president, David J. Quolke. Sanders, the district’s chief executive, said Ginn’s model could be duplicated. “Through a personal relationship, individualizing the school experience, a student having a personal desire to be here, the parents choosing the school, and teachers being selected on the basis of skill and competence and not seniority are all variables that are part of the new wave of teaching and learning,” he said. After 21 years as an assistant football coach at Glenville, 10 of which he worked for free, Ginn became the head coach in 1997. Perry, 19, is the president of Ginn Academy’s first senior class and plans to attend college on an academic scholarship. He said Toledo, Tennessee State and Morehouse were options. Perry, who lives in subsidized housing with his older sister, said they survive on government assistance and the $7-an-hour grocery store job Ginn helped him secure. Once he finishes college and starts a career, Perry said, the first thing he plans to do is buy a headstone for his mother’s grave, now marked by a stick. When he visits, he cuts the surrounding grass with scissors. The only reason Perry would consider staying in Cleveland, he said, would be to help Ginn. And students like Perry have kept Ginn from leaving for more lucrative jobs. More than 100 of Ginn’s football players at Glenville have received athletic scholarships to college, including 21 in 2005. Five are in the N.F.L., including his son, Ted Jr., a wide receiver for the Miami Dolphins. 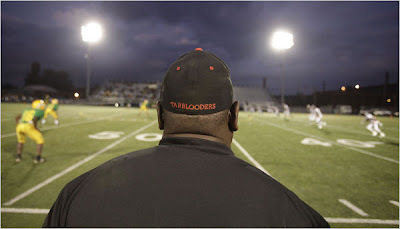 A desire to play football has kept far more in school, even if they did not go on to college. “There’s not a moment he’s awake when he’s not thinking about making this world better,” Ohio State Coach Jim Tressel said of Ginn. 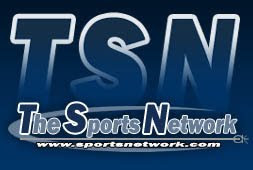 Many of Ginn’s players have played for the Buckeyes, including Troy Smith, a Heisman Trophy winner now with the Baltimore Ravens, and Donte Whitner, now with the Buffalo Bills. Ginn is often late to practice and does not carry a whistle. On a recent day, he was still wearing a pinstriped beige suit and alligator shoes on the practice field. More than 100 of Ginn’s football players at Glenville have received athletic scholarships to college, including his son, Ted Jr., a wide receiver for the Miami Dolphins. Ginn grew up so poor in tiny Franklinton, La., he considered a bologna sandwich a treat. He recalls being embarrassed that the biscuits his grandmother made left grease stains on his brown lunch bag. He also remembers removing burned crosses that the Ku Klux Klan would leave at forks in the road near his church. Ginn moved to Cleveland when he was 11 and never left. In 1974, he graduated from Glenville, where he played center on the football team and met his future wife, Jeanette. He worked as a machinist and inspected airplane landing gear before becoming a security guard at a junior high school and later at Glenville. 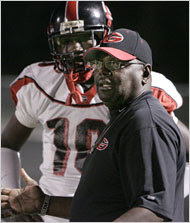 After 21 years as a football assistant at Glenville, 10 of which he worked for free, Ginn became the head coach in 1997. His career coaching record is 120-28. Ginn Academy, which opened in September 2007 with 100 freshmen and 50 sophomores, now occupies a former middle school with more than 100,000 square feet of space. It has attracted top educators and visitors from outside the district who come to see the innovative school in action. Valeria Flewelon, who teaches career technology at Ginn Academy, drove Jones to school throughout his freshman year, buying him breakfast at McDonald’s. She said the teacher-student relationships are stronger at Ginn than at any other place she has taught in 25 years in Cleveland. “Because I never gave birth to any children of my own, me being here makes me feel like I have 100-plus sons,” she said. Like the hallways at the Ginn Academy, the teachers’ mission is based on moving in the right direction. Labels: NC Sports Coaches in the News, ted ginn jr., ted ginn sr.
Baltimore Ravens placekicker Steven Hauschka (6) follows through on a point-after during the game against the New England Patriots on Sunday Oct. 4, at Gillette Stadium. Some might look at Steve Hauschka’s whirlwind journey to the National Football League and consider it a detour on his road to a career as a dentist. But somewhere along the line, the NFL became the destination. Dental school can wait. The Needham native and Baltimore Ravens placekicker made his first trip to Gillette Stadium Sunday, drilling all three of his extra-point attempts in a 27-21 loss to the Patriots. The homecoming was just the latest high point in a five-year odyssey that has taken him from football neophyte kicking at Division III Middlebury College to the game’s highest level. The 24-year-old Hauschka’s story is well documented in these parts but for those unfamiliar, here’s the Cliffs Notes version. A soccer and lacrosse player at Needham High and as a freshman at Middlebury, Hauschka, at the behest of his football player roommate, walked on to the gridiron as a sophomore. He thrived almost immediately, earning second-team All-NESCAC honors as a sophomore and junior (2004 and ‘05). As a senior, he broke the school’s single-season record with 10 field goals - eventually finishing with a career record 20 — making the All-NESCAC first team as the Panthers won the conference title. After graduating from Middlebury with a degree in neurosciences — he finished with a 3.59 grade-point was accepted into five dental schools — Hauschka took his remaining year of NCAA eligibility to North Carolina State in 2007. He earned the starting gig in 2007, becoming a finalist for the Lou Groza award as the nation’s top kicker. To this point, Hauschka’s journey closely resembles his father’s path. Peter Hauschka was a soccer and track star at Amherst College — now a NESCAC school — in the mid ’60s before earning a tryout with the Dallas Cowboys in 1967 despite never having played organized football. He also had a short stay with the Chicago Bears before attending dental school. His son had taken a similarly circuitous route to the NFL before a likely second career in dentistry. But that’s where the paths diverge. Steve signed with the Minnesota Vikings as an undrafted free agent in 2008. The Vikings placed him on waivers, but the Ravens snagged him the next day, signing him to their practice squad. Activated on Oct. 30 to share kicking duties with veteran Matt Stover, Hauschka hit his first field goal attempt, a 54-yarder against the Houston Texans. After releasing Stover — the starting kicker since the franchise’s inception in 1996 — on March 5 this year, the Ravens re-signed the 6-foot-4, 210-pound Hauschka two weeks later. Despite some early struggles, Hauschka beat out Graham Gano for the starting job, hitting six of his last seven field goals to end the preseason. So far this season, he’s connected on four of five attempts, nailed all 16 of his extra points and even made a solo tackle in a Week 2 win over the San Diego Chargers. He also has a good job — the NFL league minimum is $385,000 — even though, in this profession, he’s liable to have his teeth knocked out as opposed to being the one to repair fractured molars. And he’s got another good gig lined up once his kicking days are through. Shaun Rogers blocked a field goal and extra point, otherwise this game never gets to overtime. Josh Cribbs had 223 yards in return yardage, including long ones of 50 yards on a punt and 58 on a kickoff. Only thing he didn't do was score. 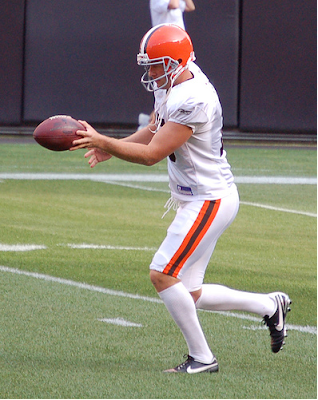 Also, due to punter Dave Zastudil, Browns enjoyed a 19-yard advantage in average drive start. Bengals had seven drives begin inside their 20-yard line. Punter David Zastudil averaged 43.7 yards per boot, but even more important, had four punts land inside the 20-yard line. He is one of the most underrated players on the team. His professional football career did not go how he hoped, but former Buckeye linebacker Andy Katzenmoyer has moved on to a new chapter in his life. Katzenmoyer reminisced about his time at Ohio State and his life now prior to his induction into the Ohio State Athletics Hall of Fame. The Big Kat is now the Big Family Man. 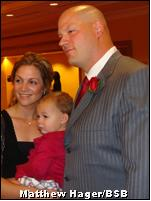 While Andy Katzenmoyer still looks like the ferocious Ohio State linebacker who won the Butkus Award as a sophomore in 1997, the former All-American looked happiest with his family Sept. 25 at The Columbus hotel when he was inducted into the Ohio State Athletics Hall of Fame. Katzenmoyer had his wife and his young daughter with him when he joined six other Buckeye greats as the newest inductees to the men’s hall. Katzenmoyer’s three-year collegiate career was memorable to say the least. Katzenmoyer still ranks in Ohio State’s top 10 for career solo tackles (197, sixth); tackles for a loss in a game (5.0, tied for first), season (23.0, second) and career (50.0, fourth); tackles for a loss yards in a season (103, tied for fourth) and career (192, sixth), sacks in a game (3.0, tied for fifth), season (12.0, tied for third) and career (17.5, tied for ninth), sack yards in a season (74, sixth) and career (114, tied for ninth); and career interception returns for touchdowns (two, tied for first). In addition to his Butkus Award win, Katzenmoyer was a second-team All-American as a freshman, a consensus All-American as a sophomore and a first-team All-Big Ten selection as a junior. He had a career worthy of the Hall of Fame, but Katzenmoyer said he was surprised by the honor. Katzenmoyer did play for some great teams as a Buckeye. His OSU career was full of on-the-field success sprinkled with some tough losses. The USA Today Defensive Player of the Year and Mr. Ohio honoree as a high school senior, Katzenmoyer started his collegiate career with the Buckeyes in 1996. Ohio State went 11-1 that season and won a dramatic Rose Bowl against Arizona State. The only blemish came in a 13-9 loss to Michigan at Ohio Stadium. The next year, Ohio State went 10 games but lost to Florida State in the Sugar Bowl. The Buckeyes entered the 1998 season as the preseason No. 1, a rank they held until an unlikely home loss to Michigan State. A win over Michigan and a Sugar Bowl victory against Texas A&M put a positive capper on Katzenmoyer’s time in Columbus. When asked what he remembers most about his time donning the scarlet and gray, he didn’t hesitate with an answer. But he hasn’t forgotten the positives, either. 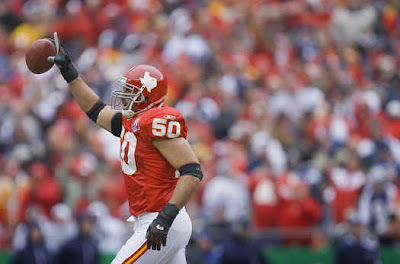 After leaving after his junior season, Katzenmoyer was drafted by the New England Patriots with the 28th overall pick in the 1999 NFL Draft. Unfortunately his professional football career did not live up to expectations. Katzenmoyer started 11 games as a rookie at middle linebacker for the injured Ted Johnson and was named to the NFL All-Rookie Team. But his season was overshadowed by a serious neck injury. A helmet-to-helmet collision with Buffalo Bills fullback Sam Gash created an injury that never fully healed. Katzenmoyer had a pair of surgeries on his neck, but his return to the field was very brief. He missed half of the 2000 season and during training camp in 2001, Katzenmoyer left the Patriots without permission after feeling pain in his neck following a physical practice. He never returned. Nonetheless, Katzenmoyer has made the transition from football hero to family man. He still lives in the Columbus area, running a personal training studio with his wife and brother-in-law in Westerville. His wife, Ashleigh, and 17-month-old daughter, Ava, posed with Katzenmoyer for pictures before Katzenmoyer’s induction. 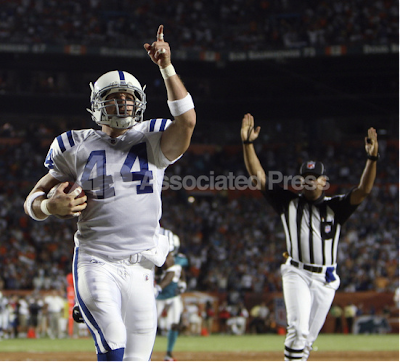 MIAMI — Dallas Clark stood in front of his locker wearing nothing but his uniform pants and a wide grin. Why shouldn't he be happy? After all, it was a short night's work for the Indianapolis Colts tight end in this 27-23 win Monday against he Miami Dolphins at Landshark Stadium. But he made the most of his relatively brief stage time. Consider that the Colts had the ball for a shade under 15 minutes and their offense barely was seen in the third quarter. Yet Clark kept busy enough to catch seven passes for 183 yards, including an 80-yard touchdown reception on Indianapolis' first offensive play of the game. "Credit their defense and them making plays," he said, "but fortunately, we were able to make the plays when we had to." And Colts quarterback Peyton Manning had just enough time to break the hearts of a Dolphins team that fell to 0-2 after last season's surprising 11-5 run to claim the AFC East title. Manning's 48-yard touchdown pass to Pierre Garcon was the difference, and it came with 3:18 remaining. That gave the Dolphins another shot, but after they moved past midfield, their heaves into the end zone couldn't connect. Manning, who threw for 303 yards, shook his head in wonder when asked about the disparity in time of possession. "We've had some games before when we sat on the sideline," he said, "but I've never seen a third quarter like that. You feel like you really didn't (earn your) letter out there in the second half. "You can kind of get away with it in the first and second quarter, but then it's time to get something going in the fourth quarter." That the Colts did, much to the chagrin of Dolphins coach Tony Sparano. "It is really disheartening," he said. "I would like to ask you guys how many times you have seen games like that where your team has the ball for 45 minutes and they run (35) plays and you have 229 yards rushing and you're 13 (of) 18 on third down. It is exactly the formula to beat that team. It is exactly the formula." Indeed, the Dolphins outgained the Colts on the ground 239-61 and had 27 first downs to Indianapolis' 14. And if anything, such numbers only added to the pain for Dolphins quarterback Chad Pennington. "We try to point out this statistic and that statistic and try to put our finger on it," he said. "It is not about statistics. It is about scoring points and winning football games. "When you play against a team like the Colts, when you get into the red zone, you need to score touchdowns. You can't kick field goals. So I am lost for words, I really am. I don't know what to say." But Pennington knew what he was feeling when watching Manning take the field before the game-winning score. "You are hoping for the best and preparing for the worst," he said. "You are hoping you can stop them, but at the same time you get your two-minute thoughts together, analyze the situation whether you are going to (be) tied or down. You are running those thoughts through your head." First-year Colts coach Jim Caldwell beamed when talking about his veteran quarterback. "It's because he can do things like he did tonight," he said of Manning. "He can lead you on drives with just enough time left; he's very smart and handles things extremely well."